Garcia & Associates is very knowledgeable in working with the California Department of Education in obtaining site approval and the required Program Educational Specifications. The have assisted in guiding our District through the intricacies of the Office of Public School Construction and the Division of the State Architect. They have been successful in obtaining DSA approvals for construction documents, addendums, field change documents and change orders in a timely manner, thus helping the District avoid costly delays. They were instrumental in assisting the District in the development of District standards and projects specifications to be implemented in new schools and other pertinent projects. Charlotte N. Werner Elementary School, which was designed by Garcia & Associates and opened in July of 2008, is a beautiful example of a well-designed, functional elementary school. Mr. Jorge Garcia is a hands-on Principal of his firm and he, along with his Project Manager, Liliana Bustos-Sheridan, give their clients their personal attention. Garcia & Associates is a full-service Architectural firm, and it is always a privilege and a pleasure to work with their friendly, well-trained professionals to bring about the successful completion of our District construction projects. 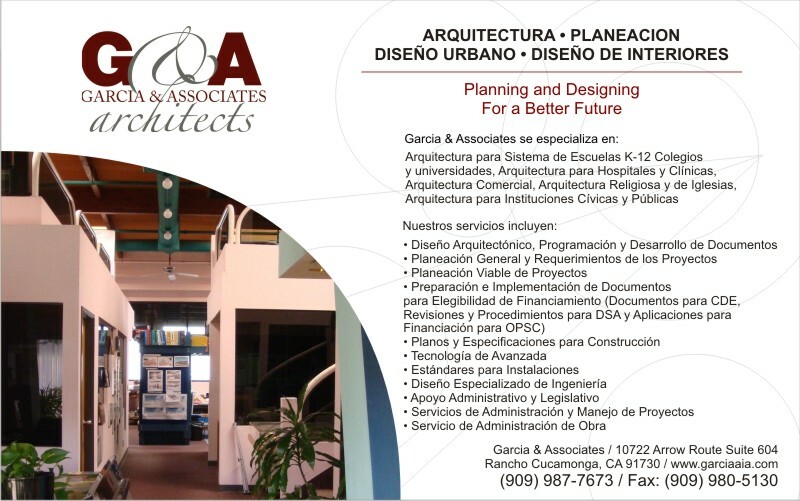 The Architectural firm of Garcia & Associates has assisted with a number of school facilities projects. Simple remodels, comprehensive modernizations, portable building projects and new construction projects for the Calexico Unified School District. The projects have been schedule and project driven, delivered on-time and within budget without sacrifice to the project’s requirements or group’s needs. The level of professionalism, quality and detail provided by Mr. Jorge Garcia and his staff can best be characterized by “competent”. The design capabilities of Garcia & Associates are outstanding and always represent an ability to listen to our needs and translate these needs into a reality. Mr. Garcia’s knowledge and experience with K-12 educational projects are broad based and proven. Garcia & Associates’ knowledge of the State School Building Program, applicable State Statues and Legislation, as well as knowledge of the OPSC funding process, assisted the District in facilitating the funding application process for our projects. Mr. Garcia and his staff have provided leadership that an architectural company with vision, constructive, creative thinking and problem solving should have. Garcia & Associates’ commitment has been noteworthy and appreciated by the Board of Trustees, administration and by our community.